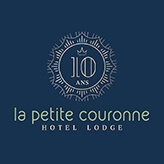 Hotel Lodge La Petite Couronne is located in a small French village in the Southwest of France, at the heart of the triangle Bordeaux – Biarritz – Pau, not far from the Atlantic coast and the Pyrenees. Discover the original concept of this small-scale hotel, which is built entirely in wood and stands in a peaceful environment. You will be welcomed by a Dutch couple Nancy and Iwan van Es, who are guiding you to one of the 10 spacious, modern rooms with large bed, free Wi-Fi and walk-in shower. From your private terrace or balcony you can enjoy direct views of the hills of Landes Chalosse. For a refreshing dip is next to the hotel the pool (6 × 13 m). With a spacious terrace, loungers and hammocks. The parasols provide adequate shade. Across the street you find our restaurant L’Auberge du laurier where you can enjoy a delicious dinner. This summer, Hotel La Petite Couronne has a real lodge, “La Cabane des Canards” or the “Duck Cabin”. A family room for 2 adults and 2 (small) children or a delightful, spacious romantic suite for 2, including our ecological spa the Dutchtub! Email us for more information. A special lodge stays on a particular spot in France. Discover our room 11. Your room is large and is equipped with a private terrace or balcony.